Always elegant and stylish, the sleek lines of our gorgeous made to measure roller blinds are perfect for the sides of any conservatory where you require a clean and simple look. Control the heat and light by lowering only the blinds where the sunlight is coming in therefore allowing you to still enjoy the view. Perfect for turning your conservatory into a sumptuous, warm and cosy retreat, our luxurious roman blinds with their elegant fabric folds are ideal if you are looking for a soft and extremely plush look. With a wide choice of designer fabric colours and designs to choose from there is something to suit all tastes. 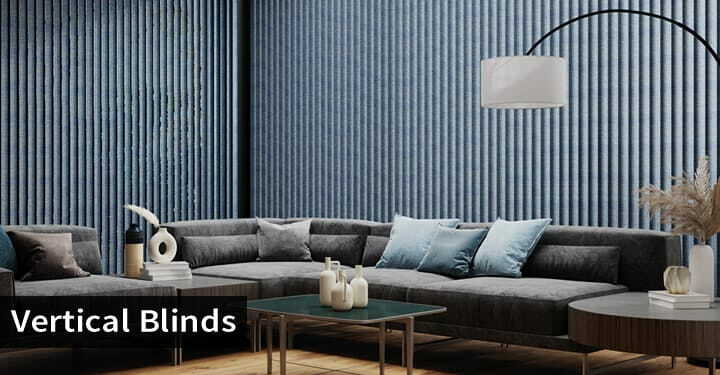 Our high quality made to measure vertical blinds are an excellent choice if you require an even greater degree of light, privacy and heat control. They are perfect for covering a number of windows around the sides of a conservatory in one blind. Choose from beautiful plain, patterned and blackout fabrics. If you are looking to combine real functionality and a fabulously natural look, then our bespoke wooden venetian blinds are ideal. They will transform the look of any conservatory whilst creating a truly relaxing atmosphere. With a choice of colours, finishes and stains these timeless woods are stunning. Bring the most beautifully natural glow and relaxing dappled lighting into your conservatory with our collection of luxury wood weave blinds. Although they will not completely block out the light, they will shade and cool the room very effectively allowing you to enjoy your sunroom in complete comfort. 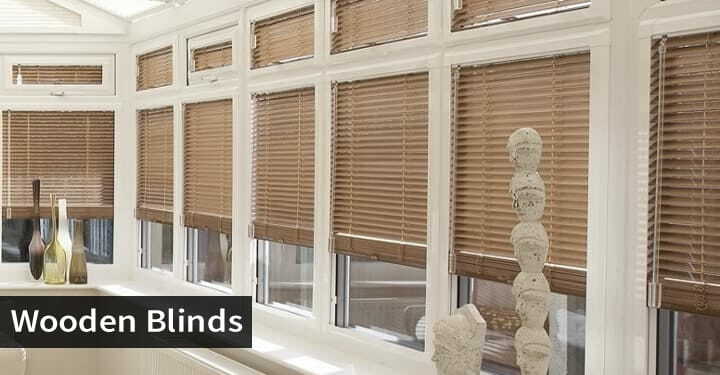 Aluminium venetian blinds are a timeless classic and a popular choice. Being metal they are extremely durable and because you can tilt the horizontals slats to almost any angle they offer complete control over privacy and sunlight. They are ideally suited to both modern and traditional conservatories. Conservatories are a wonderful retreat and a great place in which to relax and while away the hours. The only problem is that during the summer months the heat and glare from the sun can sometimes make them uncomfortably warm and bright. Conversely in the winter they can quite often be too cold and therefore go unused for many months. This is where our fabulous collection of conservatory blinds can make all the difference. The addition of some quality made to measure conservatory blinds from our beautiful range will not only help to regulate the temperature inside your conservatory, but reduce glare and being energy efficient, they will help to reduce your energy consumption and therefore your heating bills. Our wide range of conservatory blinds includes the most beautiful roller, roman, woven wood, pinoleum, vertical, wooden and venetian blinds. From plain to patterned, light wood to dark wood there are some bespoke solar protective blinds to suit any style of conservatory enabling you to create the look you are trying to achieve. 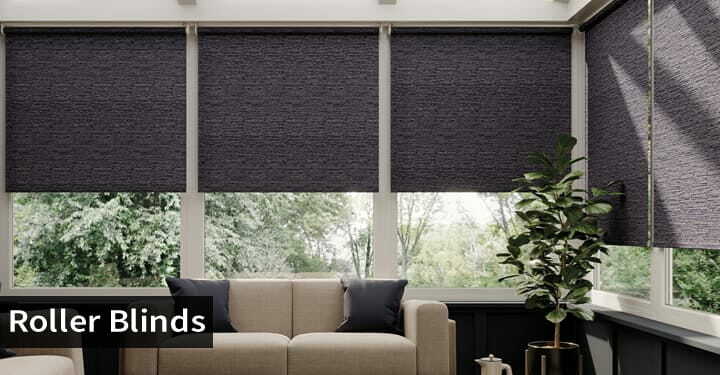 Perhaps you use it as a dining area, a kid’s playroom or just a wonderful place to admire the garden, whatever you use it for you should be able to enjoy the benefits of it all year round and you can with some of our luxury blinds which are available to buy online at discount prices. 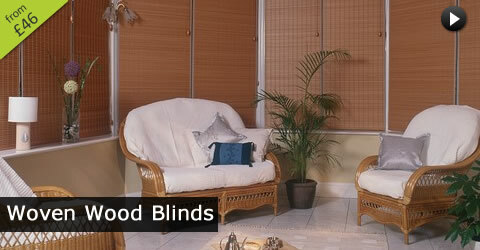 If you are wondering which blinds are best for the conservatory? Well it really comes down to personal preference and taste in most cases. 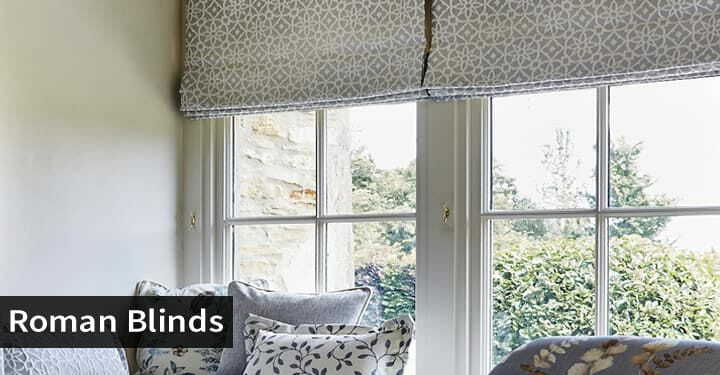 Roller blinds are a fabulous choice if you like a clean and simple look and they are perfect if you want a blind that can be raised all the way up and out of the way to enjoy the view. 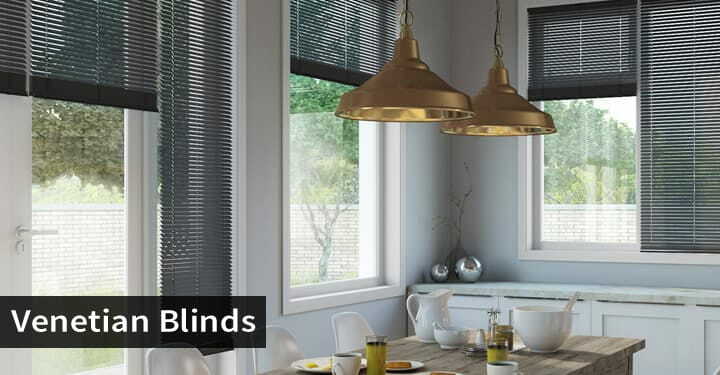 If you prefer an even greater degree of light and privacy control then our stylish range of vertical, venetian and wooden blinds are a good choice. Due to the nature of their design you can rotate the slats or louvers to an angle where you can control the light entering through the windows whilst still enjoying the view. Curtains and roman blinds offer a softer look and a more opulent and luxurious feel. They are the perfect choice if you prefer a soft fabric look and are guaranteed to add the wow factor. Whilst generally more suited to larger conservatories or sunrooms where they have got the space to not overwhelm the room, if chosen carefully they can look fabulous in any conservatory. For a more natural look and feel, you may prefer our beautiful range of woven wood and pinoleum style bamboo blinds. With a wide selection of wood weaves in roll up and roman designs to choose from, there is something to suit every taste. These really are beautiful conservatory blinds that will gently filter the sunlight and offer you privacy, whilst allowing you to enjoy the view. Whether you conservatory is contemporary or traditional in style, our luxury light filtering and thermally efficient blinds for the side windows of your conservatory, will help keep you cool through the summer, and warm during the winter, allowing you to relax and enjoy the beauty of your conservatory, sunroom, orangery or garden room at all times.